Our We Knead to Bake group has taken a new turn. Aparna, the starter of the group, suggested that members take turns to decide on the type of bread the rest can bake. I hosted the #40th bake. 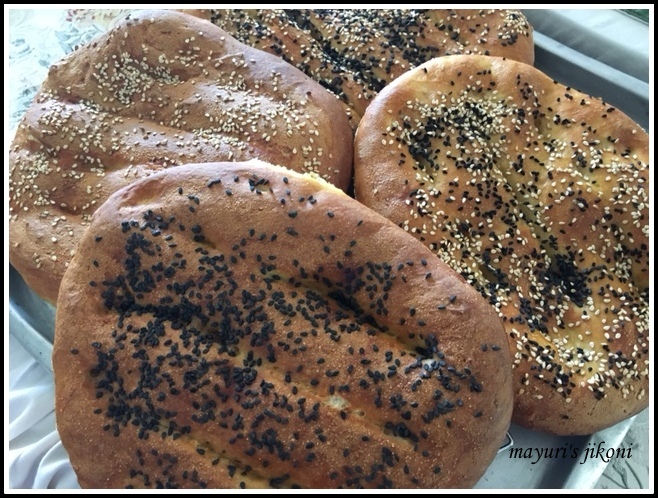 Barbari had been on my long list of bakes for a long time. Since we hadn’t baked a flatbread for eons,I decided to challenge the group with Iranian Barbari Bread. Barbari or barberi means our fathers ‘of or related to the Barbars’ in Persian language. The Barbars live in the Khorasan region, near the eastern border of Iran. The word Barbar means uncivilized, foreign, barbarian) . The Barbars hated being referred to by such a name and Reza Shah granted them the name Khavari (Easterners). However, the name of the bread remains. It’s a very popular bread baked in Iran. It’s made in traditional brick ovens. The bakers make it about 70-80cm long and 30-45 cm wide. It’s usually served with tea and a soft cheese called lighvan cheese which is made from ewe’s milk. It’s also served with typical Iranian jams (Moraba). Check out Heghineh.comon how to knead the dough and stretch it into an oval shape without using a rolling pin.Baking this bread in convectional ovens gives a different texture from those baked in the traditional ovens. If you have a pizza stone use it to bake this bread. Since our home ovens are small, I divided the dough into 4 parts. 6. Place it on the baking tray. 7. Repeat steps 3 -6 with the remaining dough. 8. Spread the remaining roomal on the bread pieces. 9. Sprinkle the top with sesame seeds or nigella seeds or a mixture of both. 11. Place the trays in the oven and bake the bread for 20-25 minutes or till it’s golden brown. 12. If you place both the trays in the oven at the same time, remember to switch their positions half way. 13. Remove the baked barbari bread from the oven and place it on a wire rack to cool. 14. Serve with tea, your favourite dip, olive oil, feta cheese or any soft cheese. Since the bread requires good gluten formation, its advisable to add gluten powder if you don’t get bread flour. Use the roomal or spread liberally to shape the bread and also so you get that lovely golden colour. Add seeds of your choice to the bread dough also if you like. Sharing with the Bread Box, hosted by Karen’s Kitchen Stories and An Italian in my Kitchen. Very informative with depth of history on this type of naan and how we can adapt it in our modern kitchen. Don't know much about roomal! Nice to know about this bread. Perfectly baked and looks inviting. As you have mentioned, feel like having it now with cheese and olives ! I have mass produced supermarket bread with no flavour – I can tell from your photos that your bread is moist and it looks delicious! Roomal is just the spread that is used to help pat out the bread and also adds that golden colour to the bread. Thank you so Heidi for the kind encouraging words.